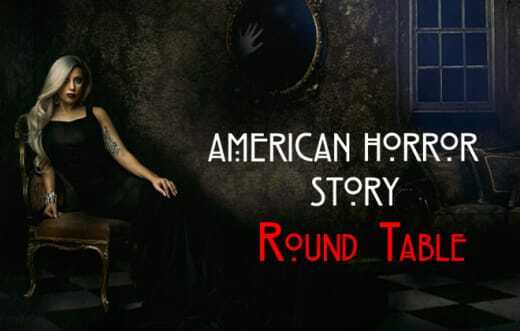 American Horror Story Round Table: Serial Killers & Psychopaths! We're all checked in for what is shaping up to be an...odd season in Hotel Cortez. Evan Peters' character was introduced on American Horror Story Season 5 Episode 2 and the TV Fanatic Round Table overwhelmingly supports the nouveau riche murdering madman turn he's taking this season. What else did we love (or not) about "Chutes and Ladders?" Join Amanda Steinmetz, Caralynn Lippo, and Miranda Wicker as we break down the many (MANY!) 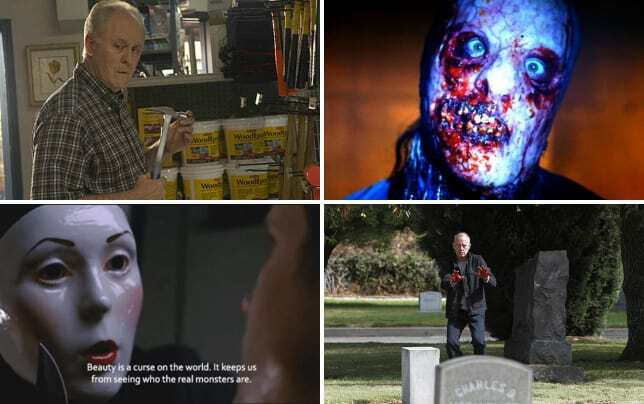 storylines happening on American Horror Story Season 5. WTF is happening on AHS: Hotel? Amanda: Everything and nothing! I have no idea where this season is heading, but the themes of addiction are everywhere. It's not exactly subtle. Caralynn: It's a hot mess in all the best ways. It's not exactly incoherent, but there is a lot happening and it's unclear how it all fits together. I'm looking forward to seeing how all the pieces fit. Everything basically makes sense so far except for Hypodermic Sally. I have NO idea what's going on there. Miranda: I feel like Ryan Murphy's tagline should be "Oops, I did it again!" where that slogan means "hey, I took this really cool idea and all of a sudden I just threw absolutely every single idea I could come up with into one season and SOMEONE PRODUCED IT!" We're all being punked. There's so much potential here for all of these stories to converge in a cohesive way and I have zero hopes that's what will happen. Which story intrigues you more: the Countess, Hypodermic Sally, or John Lowe's? Amanda: It's a tie between the Countess and Hypodermic Sally. I want to learn more about the Countess' backstory before her transformation. I'm also intrigued by Sally. She's a hot mess with her emotions all over the place. I'd like to get some backstory on her as well. John Lowe's story is a snooze-fest right now. Caralynn: I agree with Amanda. 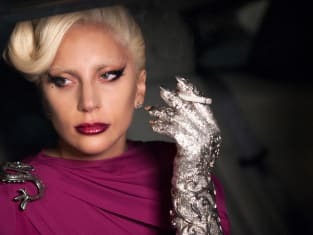 I want to know more about the Countess, but her story makes a lot more sense right now and has been laid out pretty straightforwardly after the most recent episode. So I really want to here what Sally's deal is. It seems like she's some sort of ghost-demon-y kind of thing. Lowe's story is blah. The highlight of his story is Scarlett, who is such a refreshingly smart kid. Miranda: Since I love Sarah Paulson so very much, I want to know about Hypodermic Sally. Who was she before she became a drug addict? We know how she got stuck at the hotel, but what's her story? I feel like vampire stories are getting a little overdone. Rate Evan Peters' performance as James Patrick March. Amanda: Loved loved loved it! Evan looked like he was having a blast introducing us to this demented character. His performance is simultaneously campy and terrifying. I feel like he should be hanging out with Vincent Price in a B-movie. That trans-Atlantic accent is perfect for the role. Caralynn: Oh my god, SO GOOD! 10 out of 10. That accent killed me. He was hamming it up so well, I loved it. That whole flashback sequence was by far my favorite part of the episode. Miranda: I'm giving him a 10 because he looked like he was enjoying that role immensely. Seriously. Evan Peters was meant to play demented sociopaths from every single era. I love him. Who is the serial killer John's trying to catch? Amanda: I have no clue, but I doubt it's James March since he is clearly a ghost. I'm pretty sure the same rules apply here as they did in Murder House and ghosts can't leave the premises. Caralynn: I have no idea either, but I'm inclined to think that it's someone we've yet to see. I can't see the vampires or ghosts perpetuating the murders, and that eliminates basically everyone except for like... the Lowes, Iris, Liz Taylor and the fashion designer. I don't think it's any of those people. Miranda: I wouldn't be shocked if the serial killer is someone who's just fascinated with the story of James Patrick March, but I'm still not sure how the leap was made between James Patrick March and these murders being centered around the Ten Commandments. He seems way more like a "break all the rules" type rather than the kind to kill those who break them. Will Scarlett become a kid vamp like her brother? Amanda: The thought didn't occur to me, but it's a likely possibility, since I'm sure John will be in a state of denial about his son and the hotel for a while. Caralynn: I hope not! I like Scarlett and how intrepid she is; I don't want to see her become one of those monotonous kid vamps. Miranda: My money is on this season ending up like Murder House with the whole family trapped inside the hotel, so yeah, I'm thinking she gets turned. Our children are at risk from so much in this world, and we can never protect them from all of it. But when there's something we can do to make them just a little bit safer, we do it. [to the Countess] Come on. Let's stay in. We can binge watch House of Cards! Permalink: Come on. Let's stay in. We can binge watch House of Cards!